UPDATE: Well, it turns out the Internet crafted this tale out of the (something) blue. Though reports claimed the photo above was taken after a bride accidentally invited a group of people to her wedding via text, the couple featured in the picture, Ian and Amy Hicks, revealed to People what really led to the picture perfect moment. According to the newlyweds, the wedding party happened upon rap group 7262 while making pit stops for photos with their photographer. (7262 was filming a music video for their track "Anthem.") Said the groom: "Amy and I go off to the side and get a few pictures. ... Before I can even turn around my groomsmen are already over there talking to the guys. So our photographer was like, 'All right, let's go over there.'" Before long, the wedding party and 7262 were grooving alongside one another to the group's "Anthem" — and the newlyweds ended up making the cut in the video. Of course, Ian still laughs at the Internet hoax that made their wedding photo famous: "The text is pretty funny. The #westillcoming? That's hilarious," Ian said. "But this is such a great story, because it's true. It happened to us." Watch the video below! EARLIER: If you got sent a wedding invitation by someone you didn't know by mistake, would you RSVP and show up anyway? I wouldn’t, but apparently sometimes that happens — and when it does, of course the Internet goes nuts. This, my friends, is how viral news items are born. Here’s how it went down: Bride-to-be Kristen sent out the initial invitation to a BBQ and wedding photo op taking place on June 14 via text. Unfortunately, though, one of the texts went out to a wrong number. At first, the conversation went as you might expect — “Who is this?” texted the recipient, with the reply being “Roger’s (soon to be) wife Kristen!” — before taking a turn for the weird. Even though Kristen attempted to backpedal, the folks on the other end would not be deterred, insisting that they were coming anyway. The last line of the text — “We still coming” — has since become the Internet’s new favorite thing, spawning its own hashtag, #WeStillComing, and providing us all with the best multi-purpose response for just about any situation in which you might find yourself. “I’m home sick and super contagious!” “We still coming.” “My cat has gone into heat!” “We still coming.” “Aliens have landed!” “We still coming.” Seriously — the possibilities are endless. 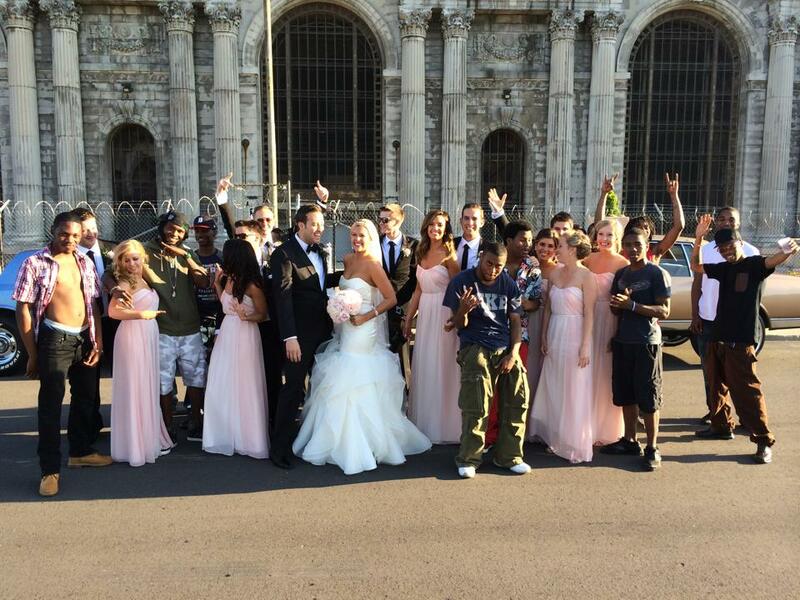 There’s some debate over exactly where this incident took place; a photo that seems to have resulted from the incident was posted to Reddit under the title, “Inviting the Detroit neighborhood to join your wedding photo. Priceless,” while other news outlets seem to think it happened in the UK. It’s also possible that the whole thing is a hoax, because, well, everything on the Internet is a hoax these days, isn’t it? After all, as the Daily Dot discovered about a month back, it’s stupidly easy to fake a text screenshot; all you'd need to do to pull this one off is edit the screenshot together with an unrelated random wedding picture you pulled from the depths of the Internet, and ta-da! A recipe for viral success! Either way, though, it’s still hilarious. Happy Thursday, everyone. Laugh heartily.